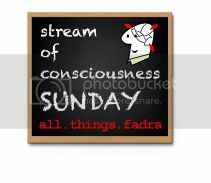 Veronica Armstrong-Archives-Stream of Consciousness Sunday: I’m tired and ready for Spring. Set a timer and write for 5 minutes. That's it! Write an intro to the post if you want but don’t edit the post. No proofreading or spellchecking. Publish it somewhere on your blog but ensure that it is accessible. Link up your post on Fadra's blog. I am desperate to go outside and go for a walk, run, damnit I wouldn't mind crawling at this point. A few weeks ago I was totally content with Winter because I am in the midst of a self makeover. I am finally taking care of myself again and starting to resemble my former self. being pregnant for two years straight has left me unrecognizable to my own self. but it is time for nice weather and sunshine. There is nothing to do in Vermont when it is cold or hot actually. Okay I know you are laughing at me but I do not ski or snowboard and wouldn't mind learning but what am I supposed to do strap C into an Ergo and fly down a mountain? Nope. Unless the activity involves the children I am not participating. My inlaws did buy us a nice annual pass to the aquarium so I think we will check that out soon. P is pretty smart so h emight be into it but he is still a baby so who knows. I went to a wedding at an aquarium once. In Boston. It smelled a little but it was pretty awesome. There was lobster and it was like a New England Clambake in the aquarium! Anyway I am rambling but you can't be made because it is stream of consciousness Sunday and that is what it is here for : ) I am off to clean, study, bake banana bread, drink and obscene amount of coffee and kiss my kids a million times.